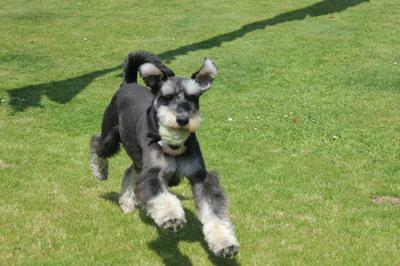 Please meet Riley our Mini Schnauzer from Ireland. He is now 10 months old and I tell you this little pup has some attitude. He walks around house and home thinking he owns the place. With his puffed out chest he marches into any situation unafraid and brazen. He truly has no fear. Only in his first 2 months this little pup with his macho attitude for unknown reasons thought it would be smart to jump into the river and go for a swim. Of course he wasn't expecting the strong current and it took 2 grown men to go in and save him. After this near death experience you would think he would have his tail between the legs for a while but no chance of this with this confident pup. With his darker than usual looks Riley really is an eye turner. Where ever he goes people just adore him even though he looks at strangers as if to say "Who the hell are you?" 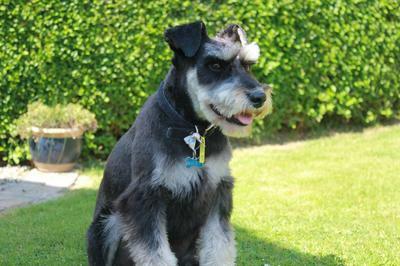 All said, he truly has brightened up the house immensely and gives a lot of love back and I'm sure you will all agree Riley is a stunning Mini Schnauzer!! Comments for The Life of Riley!! 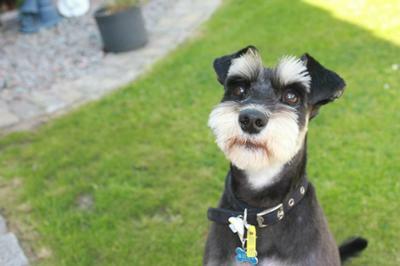 You certainly are a handsome Schnauzer Mr. Riley. My schnauzer, Harley Davidson says.....don't you know that water is only for drinking Riley?